When you brush your teeth, do you think about your heart health? According to researchers from the Royal College of Surgeons in Ireland and the University of Bristol, you should. Recent study reveals that maintaining good oral hygiene may indeed affect your heart’s health. Oral bacteria live in plaque, a sticky, colorless film that develops on your teeth. Plaque must be cleaned regularly, or it will accumulate and irritate your gums, which can lead to gingivitis or more advanced forms of gum disease. Gum disease then causes gums to become extremely sensitive and bleed when teeth are brushed or flossed. Bleeding gums provide oral bacteria easy entry into your bloodstream, where they can increase the risk of blood clots and endocarditis. In some cases, the blood vessels that supply the heart or brain can become inflamed. The researchers who discovered this link are working to develop a clearer understanding of the relationship between bacteria and heart disease and considering how new drugs may be able to help those suffering from heart conditions linked to gum disease. However, keeping oral bacteria in check by maintaining excellent dental hygiene practices is perhaps even more important. Keep plaque to a minimum by brushing twice daily and flossing every day. 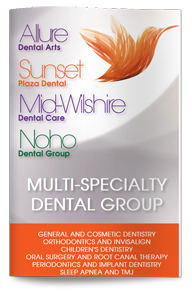 Our West Hollywood dentist, Dr. Poneh Ghasri, also encourages her patients to visit at least every six months for a comprehensive dental exam, in which she will check for signs of gum disease or other dental conditions, and a professional cleaning, which will remove all plaque and tartar buildup.